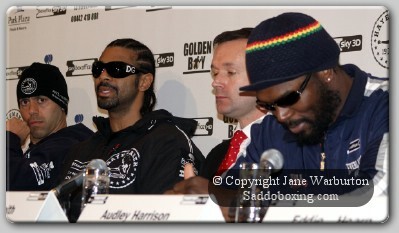 Today, at the Radisson Edwardian Hotel in the city of Manchester, England, media gathered for the official Press Conference ahead of the David Haye v Audley Harrison Heavyweight bout in which Haye defends his WBA Heavyweight Title for a second time. The Champion - Haye of Bermondsey, London, faces Harrison who – though born in London – now resides in California, USA. Todays press conference was packed with media. Haye and Harrison were joined at the top table by Adam Booth (Hayes trainer), Adam Smith (Sky Broadcaster/ Commentator), Eddie Hearn (Matchroom Sports) and Shadeed Suluki (Harrisons trainer). The much anticipated WBA Heavyweight Contest takes place on Saturday 13th November at the M.E.N Arena, Manchester and will be broadcast live on Sky Box Office. Previous Andre Dirrell: Victim Of A Boxing Mis-hap Or Its Rumor Mill?